So - I thought I would share with you guys a little collection of windsor chairs that I love to see if you think they are all country or not! Seriously – don’t you just love this room! The baby blue chairs here are so whimsical! How adorable! Love this kitchen bar – the lights and the chairs could go country in a heartbeat but the marble counters and subway tile backsplash add just enough traditional flair to suit me! Something about those long display shelves is just very contemporary – even while a lot of the accessories are a little bit country! 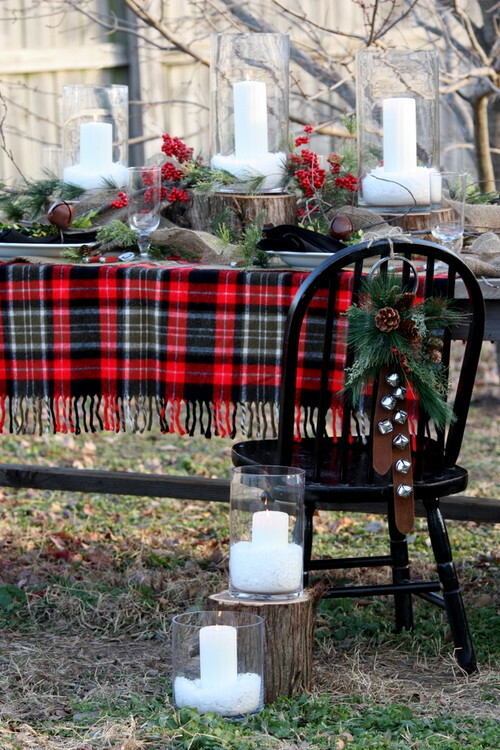 I know it isn't the holiday season any more - but I love the idea of embellishing a simple chair with a little something! Just makes it so festive! 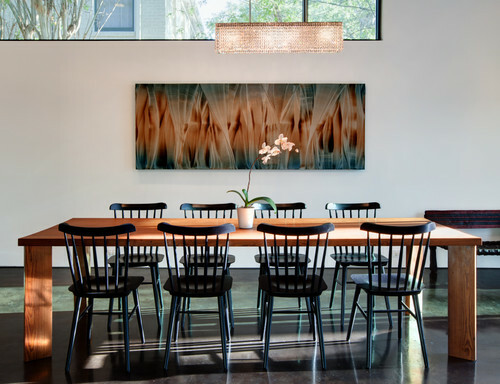 This dining area is totally modern - but the windsor chairs add a real accessible homey feel! More painted chairs! Again very contemporary but it just feels so cozy. That is why I love windsors! I couldn’t resist throwing in another kitchen – similar to the first one but again the chairs just pop with all that white! So crisp! So there you go! Wonderful windors! See any you like? Do you think they always look a lil country – or do you think they can be somewhat modern and contemporary too? I wanna know! The blue Windsors are to die for!!!! Really, I need a pop of blue like that around my house!!! Wonderful photos! I am a total chair fanatic, my family said I need therapy! 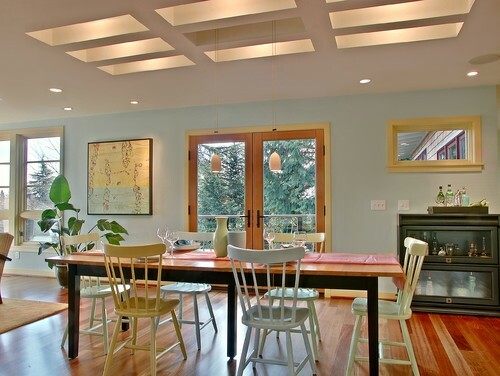 Windsor chairs are so traditional I'm not sure they'll ever really go out of style. The black ones seem a little more modern to me. I think I like the painted ones the best. 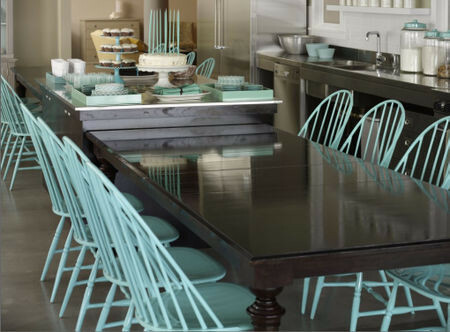 I have such a soft spot for painted furniture in general, and the Windsor chairs look so cute! Thanks for stopping my by blog! I have been wondering about painting my chairs all one color and now I am convinced that they will look just fine. Thanks for the photos and inspiration. that first photo is stunning! i'd love to have that in my house. 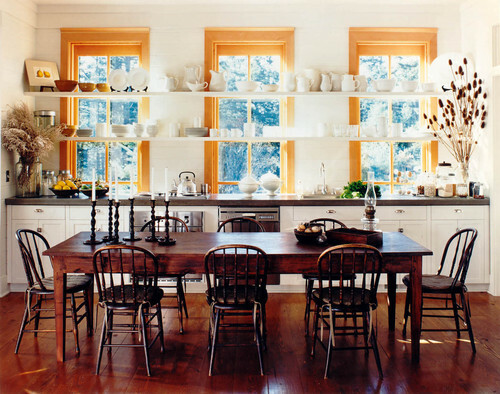 my mom has windsor chairs everywhere-- it fits for a house built in 1797 in Connecticut! i have a few, too, but they stick out funny in a 1950s California beach house. mine are going to be painted to lighten things up a bit! I think they look pretty modern in that first pic, especially. I live in an 1880 stone cottage so we're trying to have a reasonably old-style house. ahh dreamy rooms!! Thanks for stopping by my blog! !